Behind the Beautiful Forevers is a work of narrative non-fiction, meaning that it reads like a novel, but it's true. This was my first time reading such a book. One thing I noticed was that I'd be reading it, and thinking how moving the story was, and then suddenly I'd be hit with the realisation that these are real people and real events. 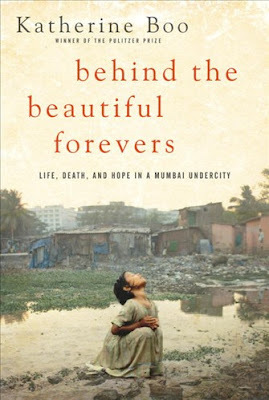 The book tells the stories of people living in Annawadi, a slum in Mumbai. As the city around them grows and prospers, with luxury hotels sprouting up all over the place, these people live in makeshift shacks and sort through garbage to sell to recyclers in order to feed their families. Yet, somehow, they still manage to have hope. Abdul, a garbage sorter, is determined to lift his large family out of poverty. Manju plans to be Annawadi's first female college graduate, while her mother Asha hatches scheme after scheme in her attempts to reach the middle class. I couldn't help but feel hopeless, though, when reading about the corruption. The police officers, doctors, politicians... all of them make threats and ask for money under the table. When people living in slums have to pay what little money they have just to keep the police officers off their backs, it's no wonder they can't make a better life for themselves. As for the writing, Katherine Boo is truly amazing. Besides making non-fiction as pleasant to read as a great novel, she writes with an objectivity that is quite impressive; rather than an angry rant, which is what most people would probably produce after witnessing what she witnessed, Boo has created a narrative that would force anyone to feel for the people whose stories she's told. Behind the Beautiful Forevers is a must read. This book counts for the 2012 A-Z Book Challenge. Full disclosure: Free copy received from the publisher. This enthralling and deeply disturbing book reads like a novel. Its setting is a small slum called Annawadi housing some 3,000 people, nestled between the new Mumbai International Airport and the five-star hotels clustered nearby. During the three-year period she studied, Boo focuses on the experiences of two families, one a familiy of 11 Muslim immigrants from India's north who have built a business as garbage-brokers, buying up the trash collected by nearby scavengers, mostly children, then sorting and selling it to recyclers. The other family is affiliated with Shiv Sena, one of the most extreme and violent anti-Muslim political parties in India. Boo's purpose in studying life in Annawadi is to understand poverty and the ways people find to transcend it. But to put this book in perspective, Boo reveals early on that "almost no one in this slum was considered poor by official Indian benchmarks. Rather, the Annawadians were among roughly one hundred million Indians freed from poverty since 1991." As anyone truly familiar with rural India can attest, in most respects conditions are far worse in many of the country's 800,000 villages than in its urban slums. That's partly because the oppressive bonds of caste bind more tightly in the countryside, which is notoriously resistant to change, than in the cities, where many of India's poorest farmworkers flee to seek a better life. Still, that "better life" is elusive because "only six of the slum's three thousand residents had permanent jobs."